“The Altar of John” depicts the scene of the baptism of Jesus Christ in the waters of the Jordan. The rite of baptism is conducted by John the Baptist, accompanied by two angels. From above, this scene is blessed by God the Father and the Holy Spirit in the form of a dove. On the side flaps on the left is St. Nicholas on the right – St. Louis of Tuzuza. Below and to the left and to the right are donators with family coats of arms. In medieval painting, it was customary to depict donators on the altar doors, that is, those people who ordered and paid for the artist’s work. As a rule, they were very rich townspeople, princes or royal persons, or clerics. They were portrayed in a humble attitude, expressing their true piety and obedience to the will of God. 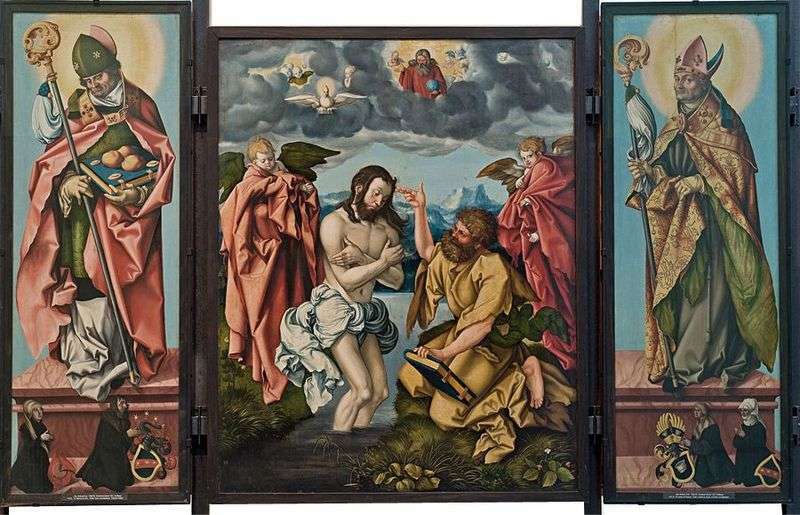 Description and meaning of the painting Altar of John by Hans Baldung.